Adamgarh Hills is located in the Hoshangabad district in Madhya Pradesh. Adamgarh Hills are famous for the pre-historic rock shelters and paintings found in the hills. Stone age artefacts, lower palaeolithic and Meolithic implements have been excavated here. Adichanallur is an archaeological sites located on the right bank of the Tambraparani River, in the Tuticorin District (formerly Tirunelveli) of Tamil Nadu. The extensive urn burial site at Adichchanallur. A number of skeletons dating from around 3,800 years ago were found buried in earthenware urns. The burials have been classified into three phases, viz., Phase I, II and III. This three-tier burial system was discovered in which earlier generations were buried in urns at 10 feet depth and recent ones above them. Phase I contains predominantly primary burials, while in Phases II & III, both primary and secondary burials are found. The skeletal remains inside the urns are invariably placed in crouched position. No orientation seems to have been followed. There are two examples of double burial. A potsherd with applique narrative (A decorative design made of one material sewn over another) scene is an important find. Good number of graffiti on pottery has been discovered. Pottery types include black and red ware, red ware and black ware. Iron implements like arrowheads, spearheads and axe are found. Few copper ornaments have also been found. Rice husk and cloth impression has been found on one of the Iron sword. A potter’s kiln (industrial activity) was also exposed in the habitational site. Korkai the capital of the Early Pandyan Kingdom is located about 15 km from Adichanallur. Sikandar Lodi, the Ruler of the Delhi Sultanate founded Agra in the year 1504. The golden age of the city began with the Mughals. It was known then as Akbarabad and remained the capital of the Mughal Empire until Shah Jahan shifted his capital to Shahjahanabad (Delhi) in the year 1638. Babar laid out the first formal Persian garden on the banks of river Yamuna. The garden is called the Aram Bagh. Akbar raised the towering ramparts of the Great Red Fort, besides making Agra a center for learning, arts, commerce and religion. Akbar also built a new city on the outskirts of Akbarabad called Fatehpur Sikri. His son Jahangir had a love of gardens and flora and fauna and laid many gardens inside the Red Fort. Shah Jahan, known for his keen interest in architecture, built here the Taj Mahal in loving memory of his wife Mumtaz Mahal in 1653. After the decline of the Mughal Empire, the city came under the influence of Marathas and was called Agra, before falling into the hands of the British Raj in 1803. The Ahar culture or Banas culture is a Chalcolithic culture of southeastern Rajasthan lasting from 3000 to 1500 BCE, contemporary and adjacent to the Indus Valley Civilization. The Ahar-Banas people were exploiting the copper ores of the Aravalli Range to make axes and other artefacts. They were sustained on a number of crops, including wheat and barley. Several sites of Ahar or Banas culture have been identified in the Banas and berach river systems (Between Udaipur and jaipur). Ahar, Gilund, Balathal are three major excavated sites. Sites of Ahar culture show the use of a great variety of raw materials including steatite, shell, agate, jasper, lapis lazuli, copper, blonze. Shell objects were locally made but shell came from Gujarat coast. The discovery of carnelian beads, a lapiz lazuli bead, and Rangpur type lustrous red ware suggests connection with harappan sites in Gujarat. Typical Ahar pottery is a Black-and-Red ware (BRW) with linear and dotted designs painted on it and has limited range of shapes, which include bowls, bowls-on-stands, elongated vases and globular vases. The Ahar culture also had brightly slipped Red Ware and ceramics in Burnished Black that were incised Thin Red ware. The pottery had a black top and reddish bottom, with paintings in white on the black surface. Because of these distinctive features, Ahar was called the “black and red ware culture“. Ahichatra is in Bareilly district of Uttar Pradesh. It was the ancient capital of Northern Panchala. A brick fortification has been excavated. By the middle of the second millennium BC, Ochre Coloured Pottery Culture followed by Black and Red Ware culture has been found. Around 1000 BC, it became one of the largest Painted Grey Ware culture sites. PGW followed by NBPW Period. Panchala and Kushana coins have been found here. Ahmadnagar was founded in 1490 by Ahmad Nizam Shah who was the governor of Chunar under Bahmani rulers. With the breakup of the Bahmani Sultanate, Ahmad established a new sultanate in Ahmednagar, also known as Nizam Shahi dynasty. It lasted until its conquest by Mughal emperor Shah Jahan in 1636. In 1759, the Peshwa of the Marathas obtained possession of the place from Nizam of Hyderabad and in 1795 it was ceded by the Peshwa to the Maratha chief Daulat Rao Sindhia. It came into the possession of the British in 1817, according to the terms of the Treaty of Poona. It was founded by Ahmad Shah of Muzaffarid dynasty of Gujarat in the 1411 AD. In 1487, Mahmud Begada, the grandson of Ahmed Shah, fortified the city. It was capital of Gujarat. Akbar annexed it in 1572 and made it Mughal province. Here many Hindu-Islamic architectures are found like: Jami Masjid, Jhoomta Minar, Tomb of Rani Sipri etc. Shahjahan sponsored the construction of the Moti Shahi Mahal. During the Mughal reign, Ahmedabad became one of the Empire’s thriving centres of trade, mainly in textiles, which were exported as far as Europe. Ahmedabad remained the provincial headquarters of the Mughals until 1758, when they surrendered the city to the Marathas. Ajmer, surrounded by the Aravalli Mountains in Rajasthan, is a pilgrimage centre for the shrine of the Sufi Saint Khwaja Moinuddin Chishti. Ajmer was founded in the late 7th century A.D. by Ajayraj Singh Chauhan. It was conquered by Muhammad Ghori in 1193 after Battle of Terrain with Prithviraj Chauhan. It regained independence under the ruler of Mewar in 1365. Later it was conquered by the Marwar in 1532. The city was conquered by the Mughal emperor Akbar in 1559 from Rathor ruler Madeo. In the early 1700s century, control passed to the Marathas. Akhnoor is an archeological site located near Jammu on the banks of the Chenab River. Manda, Akhnoor is the northern most site of Harappan civilization. Terracotta figures and other anthropological objects belonging to the later Harrappan period have been found. The neaby place was a prominent abode of Buddhism during the Kushan period and Gupta period. Apart from an ancient Stupa, life sized Terracotta busts of Buddha and coins belonging to those periods were also excavated from the sites located nearby. The Akhnoor fort holds great significance. Work on the fort began in 1762 at the behest of Raja Tegh Singh and was completed by his son Raja Alam Singh in 1802. Here, there is a Parashurama temple where Parashurama Jayanti is celebrated annually, on the same day in May as Akshaya Tritiya. Alamgirpur is an archeological site of the Indus Valley Civilization (IVC) and Painted Grey Ware culture located in Meerut district, Uttar Pradesh. It is the eastern most site of IVC and only IVC site across the Yamuna. It mostly belongs to Late Harappan period. Typical Harappan pottery was found and the complex appeared to be a pottery workshop. Pottery has geometric motif. Ceramic items found included roof tiles, dishes, dice, beads, terrecotta cakes, figurines of a humped bull. Beads made of steatite paste; carnelian, quartz, agate and black jasper are found. A broken blade made of copper was found. Noteworthy find it textile inn plain weave on a potsherd. Allahabad is located in Uttar Pradesh. The earlier settlements of the Aryans were established in this city, then known as Prayag. The city’s original name – Prayag, or “place of offerings” – comes from its position at the Sangam (confluence) of the Ganga, Yamuna and mythical Sarasvati rivers. As per Rigveda the Sarasvati River (now dried up) was part of the three river confluence in ancient times. It is one of four sites of the Kumbh Mela, an important mass Hindu pilgrimage. Nearby Kaushambi was ancient capital of Vatsa Mahajanapada during 6th century BCE. It has Northern Black Pottery Ware. Ashokan Pillar with inscriptions of third century B.C. contains command from the Emperor Ashoka addressing the senior officials (Mahamatras) of Kaushambi urging them to avoid dissension and stay united. Ashoka pillar also contains later inscriptions attributed to the Gupta emperor, Samudragupta (4th century CE) by his court poet Harishena describing conquests of Samudragupta and praising him. The Chinese traveler Huan Tsang in 643 BC found Prayag inhabited by many Hindus who regarded the place very Holy. 1575 AD Emperor Akbar founded the city in by the name of “Illahabad” or “Place of Allah” which has now become Allahabad. It had the strategic importance due to situated at the confluence of rivers. In medieval India the city enjoyed the honour of being the religio-cultural center of India. For a long time it was Provincial capital of the Mughals. Later it was captured by Marathas. In 1801 AD, the British history of the city begun after the Nawab of Oudh ceded it to the British Throne. British army used the fort for their military purposes. Historic sites in Allahabad include Alfred Park, the Victoria and Thornhill Mayne Memorials, Minto Park, Allahabad Fort, the Ashoka Pillar and Khusro Bagh. Maharaja Alaghraj, second son of Maharaja Kakil of Amer (old seat of Jaipur state) ruled the area in the eleventh century and his territory extended up to the present city of Alwar. He founded the city of Alwar. The princely state of Alwar was ruled by Pratap Singh, a Rajput of the Kachwaha lineage, in 1770. It is situated in Guntur District of Andhra Pradesh on the bank of Krishna River. It was the capital of Satavahanas (2nd century BCE to 3rd century CE). After the decline of Satavahanas, Ikshvakus, later Pallava kings and Cholas ruled over the region. The region between Krishna and Godavari rivers was an important place for Buddhism with Amaravati being one of them. It has Buddhist Stupa and Mahachaityas, inspired by Mahasamghika sect of Buddhism, with marble and limestone sculptures. Buddhist Stupa was probably built during the reign of Ashoka. Its carved panels tell the story of Buddha. Chinese traveller Hiuen Tsang visited Amaravati in 7th century and wrote a glorious account of the Stupa, Viharas and monasteries that existed. Ancient School of Arts: Amaravati art was as one of the three major styles or schools of ancient Indian art, the other two being the Gandhara style and the Mathura style. Amaravati art form evolved and flourished for nearly six centuries commencing from 200-100 BC. It was patronized first by the Satavahanas and later by the Ikshvakus. Some of the Buddhist sculptures of Amaravati have GrecoRoman influence that was the direct result of the close trade and diplomatic contacts between South India and the ancient Romans. It is located in Sindh province of Pakistan. This province was ruled by one of the subclan of Paramara Rajputs. Mughal king Akbar was born in Amarkot when his father Humayun fled from military defeat at the hands of Sher Shah Suri. Rana Prasad, a Rajput ruler of Amarkot, gave refuge to Humayun. In 1843, the English army under Sir Charles Napier invaded it. Amber is ancient name of Jaipur and famous for the glass house and elegant forts. It was established by the Kachhawaha King Dulha Ray in 1128. Much of the present structure known as Amer Fort is actually the palace built by Raja Man Singh who ruled from 1590-1614 A.D. The palace contains several buildings, such as the Diwan-i-Khas, and the elaborately painted Ganesh Poll built by Mirza Raja Jai Singh I (Man Singh I’s grandson). Amer was capital of the Kachwahas until 1727 when the ruler of Amer Sawai Jai Singh II founded a capital Jainagara (Jaipur), named after him, about nine kilometers south of Amer. Amarkantak is a pilgrim town for Hindus located in Anuppur District of Madhya Pradesh. Amarkantak region is the meeting point of the Vindhyas and the Satpuras. This is the source of the rivers Narmada and Sone. The poet Kalidas has mentioned it Amarkantak as Amrakuta. The Kalchuri Maharaja Karnadeva (1042–1072 AD) had constructed temples here. Amri is an ancient settlement in Sindh province of Pakistan.The site is located south of MohenjoDaro about 110 kilometres north of Hyderabad. Pre-Harappan stage:The earliest phase was a fortified town which flourished from 3600 to 3300 BC, and belonged to the Pre-Harappan stage of the Indus Valley Civilization. Amri is close to Balochistan where development of earlier farming communities from 6000BC to 4000BC ultimately led to urbanization. The ancient mounds of 8 hectares on the west bank of Indus River have been extensively excavated. The pottery discovered here had its own characteristics and known as Amri Ware. Like other Pre Harappa towns, no writings were found at this site. There is evidence of widespread fire at the town around 2500BC. Later phases: In period II (2750-2450 BC), more and more elements of the Indus Valley culture appear. Period III (2450-1900 BC) belongs almost entirely to Indus Valley culture. Period IV (1900-1300 BC) is marked by the mingling of cultural layers. Elements of the Jhukar culture appear, and co-exist with the last phase of the Indus Valley culture. Later, the elements of the Jhangar culture also appear. Based on the evidence from this site, it is believed that the Indus culture was probably not developed directly from the Amri culture. Amritsar was named after the lake founded by the fourth Sikh Guru Ram Das in 1574. Earlier, Guru Ram Das had begun building Santokhsar Sarovar. It is home to the Harmandir Sahib (Golden Temple), the spiritual and cultural center for the Sikh religion.The city also houses the Sikh temporal and political authority, Akal Takht, as well as the Sikh Parliament. The city lies on the main Grand Trunk Road (GT Road) from Delhi to Amritsar connecting to Lahore in Pakistan. It is an old town and a fortress situated in the Raichur district of Karnataka on the left bank of Tungabhadra. It was the seat of the Rajas of Anegondi, who were the lineal descendents of the Kings of Vijayanagara found at Hampi. The Vijayanagara dynasty ruled this place from 1336 to 1565 when it was overthrown by Sultan of Deccan. During 16th, 17th and 18th centuries, Anegundi was ruled by Bijapur Sultans, Moghuls, Marathas and Tipu Sultan. Anegundi has Fort with a Durga temple and a Ganesha cave temple where Vijayanagara kings used to pray. Anga was a kingdom that flourished on the eastern Indian subcontinent in the 6th century BCE until taken over by Magadha in the same century. Counted among the “Sixteen Mahajanapada” in Buddhist texts like the Anguttara Nikaya, Anga also finds mention in the Jain Vyakhyaprajnapti’s list of ancient janapadas. Between the Vatsas and the realm of Anga, lived the Magadhas. A great struggle went on between the Angas and its eastern neighbors. About the middle of 6th century BC, Bimbisara, the crown prince of Magadha had killed Brahmadatta, the last independent king of Anga and seized Champa. Thenceforth, Anga became an integral part of growing Magadha empire . Located North West of Guwahati, it is a site for important archaeological excavations related to ancient Assam. Later Mulraj, the adopted son of last Chavda king, established Solanki dynasty. He successfully expanded kingdom to west. Solanki rule cover Saurashtra and Kutch in the West, Lata in the South, Malwa in the East and Southern Rajasthan in the North at its greatest period. When Muhammad Ghori had attempted to conquer Gujarat, the forces of Mularaja II, then the king of Patan, a mere boy-ruler, led by his heroic mother Naikidevi, inflicted such a crushing and conclusive defeat on him that he never again entered India through Gujarat. Muhammed’s general and later Sultan of Delhi Qutb-ud-din Aybak sacked the city between 1200 and 1210, and it was destroyed by the Alladin Khilji in 1298. The modern town of Patan later sprung up near the ruins of Anhilwara. During 1304 to 1411, first Patan was the Suba headquarter of Delhi Sultanate and then capital city of Gujarat Sultanate after the collapse of the Delhi Sultanate at the end of the fourteenth century. A new Fort was built by these Subas. In 1411, Sultan Ahmed Shah moved the capital to Ahmedabad. Rani ki vav : During the period of the Solanki dynasty, the stepwell called the Rani ki vav (Queen’s step well) was constructed. It was built by Udaymati in memory of her husband, Bhimdev I (1022-1063). It was one of the largest and the most sumptuous structures of its type. There is also a small Gate below the last step of the step well which has a 30 kilometre tunnel built which leads to the town of Sidhpur near Patan. It was used as an escape gateway for king who built the step well in the times of defeat. Most of the sculpture is in devotion to Vishnu, in the forms of his Avatars (Krishna, Rama and others). It was included in the list of UNESCO World Heritage Sites on 22 June 2014. Anuradhapura is a sacred city for Buddhism and ancient capital of Sri Lanka. This city was established around a cutting from the ‘tree of enlightenment’, the Buddha’s fig tree, brought there in the 3rd century B.C. by Sanghamitta, the founder of an order of Buddhist nuns. Mauryan Emperor Ashoka had sent his son Mahinda, to the island of Lanka. According to Dipavamsa and Mahavamsa, Thera Mahinda came to Sri Lanka from India and met King Devanampiya Tissa and the people, and preached the doctrine 236 years after the passing away of the Buddha. This is the point at which a kingship began and a civilization developed based on Buddhism. With the introduction of Buddhism, the city Anuradhapura gained more prominence and the great building era began. During the late Anuradhapura period, the royal family and nobility of Sri Lanka strongly supported Buddhism. Art works featuring depictions of Avalokitesvara, the Bodhisattva of Mercy and Compassion, became increasing popular. Several ancient munumnts like Buddhist temples, stupas etc are located in Anuradhapura. Abhayagiri Monastery spreading was founded by King Valagamba in 1st century BCE. The 2m tall Buddha statue, popularly known as the Samadhi statue is a masterpiece of Sinhalese sculpture of Buddha in meditative posture carved in stone during the 4th century. Thuparama dagoba is an ancient stupa was built by King Devanampiya Tissa in the third century BC. Anuradhapura flourished as a Ceylonese political and religious capital for 1300 years and later was abandoned after an invasion in 993. It is situated ub Gaya district of Bihar. An undate inscription of a ater Gupta king Adityasena Gupta has been found here. It records that the king built a temple in honour of Vishnu, brick temple of Vishnu with panels depicting scenes from Ramayana has been found and is ascribed to the later half f the 7th century A.D.
Arikamedu is located on the eastern coast near Puducherry. It was known as Poduka to the Romans. It was a famous port during the sangam Age (200 BC – 300 AD) mostly under Early Chola. It had bead making facility and trading with Roman traders took place. Various Roman artifacts, such as a large number of amphorae bearing the mark of Roman pottery have been found at the site, supporting the view on an ancient trade with Rome. Roman lamps, glassware and gems have also been found at the site. A rich haul of Roman golden coins proves that India got a lot of gold in return of her export. Asirgarh Fort in Khandesh, built by Asa Ahir of the Ahir dynasty, is situated in the Satpura Range near the city of Burhanpur, in Madhya Pradesh. Since the fortress commands a pass through the Satpuras connecting the valleys of the Narmada and Tapti rivers, one of the most important routes from northern India to the Deccan, it was known as the “key to the Deccan“. There is an ancient Shiva temple below the fort. Initially it was in the possession of Rajput kings but later was annexed by Alauddin Khalji. From 1370 to 1600 AD, it was governed by Faruukhi Kings. In 1601, Akbar invaded and captured it.This was a significant achievement of the Mughals, for Khandesh was used as a base for the future conquest of the Deccan. Marathas got it after Mughals. Assaka (Sanskrit: Ashmaka, Pali: Assaka),on the banks of the Godavari river, was a region of ancient India (700–300 BCE). It was one of sixteen mahajanapadas in the 6th century BCE, mentioned in the Buddhist text Anguttara Nikaya. It was the only Mahajanapada situated to the south of the Vindhya Range, and was in Dakshinapatha. It corresponds to districts Nizamabad and parts of Adilabad in Telangana and Nanded, Yavatmal in Maharashtra. Kotilingala, Telangana was the capital of this janapada. Another capital was Potali, or Podana identified as Bodhan in Nizamabad district in Telangana. Atranjikhera is in Etah district of Uttar Pradesh. It is a prehistoric and historic excavated archeological site on the bank of the Kali Nadi, a tributeries of Ganga. The excavations have brought to light rich deposits of the Painted Grey Ware period (1000 BC to 600 BC) and include iron objects such as spearheads, arrowheads, knives, axe, etc. The remains of iron furnace along with the slag indicate the existence of a fully developed iron industry. In the Northern Black Polished Ware period (6th to 2nd century BC) the use of iron tools and implements like the sickle, hoe, ploughshare clearly seen.The discovery of coins, seals, use of burnt bricks etc suggest the urban character of the site in the NBPW phase. A coin mould of the Kushana period is a significant find. Some fine sculptures like a Jaina tirthankara represent the Gupta and the later art traditions. The remains of Vikramshila Mahavihara University, founded by the King Dharmpal (770-810A.D.) of Pala dynasty has been found in the excavation of village Antichak in district Bhagalpur of Bihar. Vikramasila was a large Buddhist university having more than hundred teachers and about one thousand students. It produced eminent scholars who were often invited by foreign countries to spread Buddhist learning, culture and religion. The most distinguished and eminent among all was Dipankara, who propogated Buddhism in Tibet. Subjects like theology, philosophy, grammar, metaphysics, logic etc. were taught here but the most important branch of learning was Tantrism. The main stupa built for the purpose of worship is a brick structure. A rectangular structure identified as library building. A large number of antiquities of terracotta, stone, iron copper, gold, silver, bronze, ivory, bone and shell have yielded in course of excavations. A large number of stone and bronze sculptures of Buddha, Bodhisattva, Avalokiteshwara, Maitreya, Manjusri, etc. have been found. Characterised as a type-site of the Acheulian handaxe-based ‘Madras Industries’. Situated in the Kortallayar river basin, Tamil Nadu, north west of chennai, Attirampakkam is one of numerous Lower and Middle Palaeolithic sites in the region. Excavations have revealed a multicultural site with stratified Lower, Middle and Upper Palaeolithic deposits .The presence of Acheulian artefacts in clay beds, indicative of a palaeo flood plain situation, represents a new ecological habitat to be identified in the Indian Palaeolithic. Acheulian artefacts, mainly handaxes, are of quartzites, which are not available locally. Microliths, medieval potsherds and bricks have been noted on the surface. The discovery of three fossil teeth is significant, as fossils are rare at Indian Lower and Middle Palaeolithic sites. These indicate at least three different fossil species suggestive of an open and wet landscape. Attirampakkam is unique in providing an opportunity to study transitions through time, and changing hominid adaptive strategies over the Pleistocene, with assemblages preserved in a largely primary context. Attock is situated on the eastern bank or river Indus, now in Pakistan. It was part of kingdom of Kabul for some time when the Hindus had their dominance over there. It also saw the rule of Ghori and Ghaznavi rulers. When Sher Shah became the Emperor of India, he took interest in providing quick means of transportation and communication to his people and constructed a Grand Trunk Road from Sonargaon to Attock. It became a part of Mughal Empire and Attock fort was completed in 1583 under the supervision a minister of Emperor Akbar. Aurangabad is in Maharashtra. Its early name was Fatehabad. A prime minister of Nizam Shah of Ahmednagar, Malik Ambar established a town at a village called Khirki in 1610. Later, his son Fateh Khan named the town as Fatehpur in 1626. The town was at the centre of India and was considered as a strategic location. When Aurangazeb took over the Deccan kingdoms, he changed the name of the town to Aurangabad in 1653. Aurangazeb used the town as the strategic point to suppress Marathas and Deccan Sultanates. Aurangabad was taken over by the Nizam of Hyderabad after the death of Aurangazeb. Aurangabad is a tourism hub, surrounded by many historical monuments, including the Ajanta Caves and Ellora Caves as well as Bibi Ka Maqbara. The Bibi Ka Maqbara is a mausoleum in Auragabad, built by Azam Shah, son of Aurangzeb, in 1678 in memory of his mother, Banu Begum. Avanti was one of the 16 Mahajanpadas and by the 6th century BC, it is mentioned in Buddhist literature as one of the four great powers along with Vatsa, Kosala and Magadha. Avanti was divided into two parts by the Vindhyas, the northern part had its capital at Ujjayini and the southern part had its centre at Mahishmati (or Maheshwar, on the north bank of the Narmada River). Ujjain lay on the main trade route between North India and Deccan going from Mathura via Ujjain to Mahismati. The Northern black polished ware found their way to the northern Deccan from the Gangetic plains through Ujjain. King Pradyota of Avanti was contemporary to Buddha. Avanti was defeated by Shishunaga, the king of Magadha and became part of the Magadha. During the reign of Mauryan King Bindusara, Prince Ashoka was the provincial governor of Ujjain. In Pulwama district of J&K, Awantipora has a number of ancient Hindu temples built by King Awanti Varman (AD 855- 883) when he chose the site as his capital. Avantishwar temple, dedicated to Siva on the banks of the River Jhelum (Vitasta). Less than a kilometer away is Avantiswamin temple dedicated to Vishnu. The two temples are quite similar structurally. The walls of the entrance are ornamented with sculptured reliefs both internally and externally. The ruins of temples constructed by Lalitaditya, the Brahmin emperor of Kashmir, are also located in Awantipura. It is situated on the right bank of the river Sarayu in Faizabad district of UP. In the 6th century BC, it was the southern capital of Mahajanpada Kosala. Its other capital was at Savatthi (Sravasti), about 60 miles north of modern Ayodhya. Kosala was ultimately merged into Magadha. It is believed to be the birthplace first and fourth Jaina tirthankara. A Buddhist text, the Majjhima Nikaya mentions Buddha as a Kosalan. Mahavira, the 24th Tirthankara of Jainism taught in Kosala. In the time of king Mahakosala, the conquered neighboring kingdom of Kashi had become an integral part of the Kosala kingdom. Mahakosala was succeeded by his son Prasenajit. He was a follower of Buddha. The excavation shows that Ayodhya was occupied since the NBPW phase (6th century BCE) and revealed brunt brick structures, terracotta ring wells, punch marked and inscribed copper coins. In mythology, Ayodhya is related to Lord Rama. Aihole is in Bijapur district of Karnataka. It was the first capital of western Chalukyas which was later moved to Badami. It is known for Chalukyan architecture, with many stone temples dating from 5th century CE. It lies to the east of Pattadakal, while Badami is to the west of both. Aihole has been described as one of the cradles of temple architecture and contains the earliest structural temples known in India. The Chalukyan architectural styles inherited largely from their neighbors to the north and south of their kingdom. Durga temple, Meguti temple, Jain temple, Rock-cut Jain Basadi, Huchimalli (gudi) temple. Ravana Phadi cave is one of the oldest rocks cut temples in Aihole. Jain cave temple is on the banks of Malaprabha River. A Buddhist Chaitya Cave temple is found which is partly rockcut structure. Galaganatha group temples are one of nearly thirty temples on the bank of the Malaprabha River. The main shrine of the Galaganatha temple is enshrining Shiva. A group of three temples is referred to as the Kontigudi group of temples. One of these is the Lad Khan temple which is the oldest temple at Aihole and has Shiva Lingam. The Aihole Prasasti in Meguti Temple at Aihole was composed by Ravikirti, the court poet of Pulakesin II in 634 A.D. It is written in Sanskrit language and old Karnataka script and gives a dtailed account of Pulakesin II’s exploit against his neighbouring kingdoms like the Pallavas. It describes the victory of Pulakesin II against King Harshavardhana. The Ajanta is located in Aurangabad district of Maharashtra. It is famous for Buddhist Caves which were cut, carved and painted at different times from 2nd century BC to 7th century AD. Ajanta Caves have been a UNESCO World Heritage Site. The caves include paintings and sculptures are the finest surviving examples of Indian art, particularly painting, which are masterpieces of Buddhist religious art, with figures of the Buddha and depictions of the Jataka tales. The 7th century Chinese Pilgrim, Huen Tsang informs us that Dignaga, a Buddhist philosopher, author of well known books on logic, lived at Ajanta in the 5th century. The caves were built in two phases starting around the 2nd century BCE during Satavahana rule, with the second group of caves built around 5th to 7th century AD during Vakațaka period. Caves of the first period include Cave 9 and 10 (Chaityas) and Cave 8 and 12 (Viharas). The first phase is dedicated to the Hinayana Buddhism when the Buddha was revered symbolically. The second phase began in the 5th century during the reign of King Harishena of the Vakataka dynasty. The second phase is mainly dedicated to Mahayana Buddhism. The most elaborate caves were produced in this period. Caves of the second period also include chaityas and viharas. Ajanta Caves appear to have been abandoned by wealthy patrons shortly after the fall of Harishena. The monasteries mostly consist of vihara halls for prayer and living, which are typically rectangular with small square dormitory cells cut into the walls, and by the second period a shrine or sanctuary at the rear centred on a large statue of the Buddha. This change reflects the movement from Hinayana to Mahayana Buddhism. The viharas of the earlier period are much simpler, and lack shrines. Mural paintings survive from both the earlier and later groups of caves. The earliest phase of painting and pictures reflect the influence of sculptures at Sanchi and Bharhut. All paintings though influence by the Jataka and other Buddhist stories depict the life style of the rich as well as of the common man, besides the flora and fauna. The paintings mainly use five colors like red or yellow ochre, lime, lamp black, greenish, Lapiz lazuli. Mount Abu is located in Rajasthan in Aravali Range. The ancient name of Mount Abu is Arbudaanchal. In the Puranas, the region has been referred to as Arbudaranya (“forest of Arbhuda”). It is believed that sage Vashistha retired to the southern spur at Mount Abu following his differences with sage Vishvamitra. Mount Abu region is said to be original abode of the famous Gurjars. These Gurjars migrated from Mount Abu region and as early as sixth century CE, they set up one or more principalities in Rajasthan and Gujarat. Mount Abu later came under Parmaras. The conquest of Mount Abu in 1311 CE by Rao Lumba of Deora-Chauhan dynasty brought to an end the reign of the Parmars and also marked the decline of Mount Abu. He shifted the capital city to Chandravati in the plains. According to a legend, sage Vasishta performed a great yajna at the peak of Mount Abu, to seek from the gods a provision for the defense of righteousness on earth. In answer to his prayer, a youth arose from the Agnikunda (fire-altar)—the first Agnivansha Rajput. The most famous attraction in Mount Abu, the Dilwara Jain temples was constructed around 12th century AD. These beautifully carved temples in white marbles are dedicated to different tirthankaras. The Vimal Vasahi temple in the complex is dedicated to Adinath, the first Jain tirthankaras. Other famous attractions in Mount Abu include the Gaumukh Temple, Adhar Devi Temple and Shri Raghunathji Temple. Gud one.. can you post all other topics left in ancient , modern and medieval i dia? This is just amazing. I have no words to thank you for this effort. Please keep continuing, whoever you are. can you give a little info. 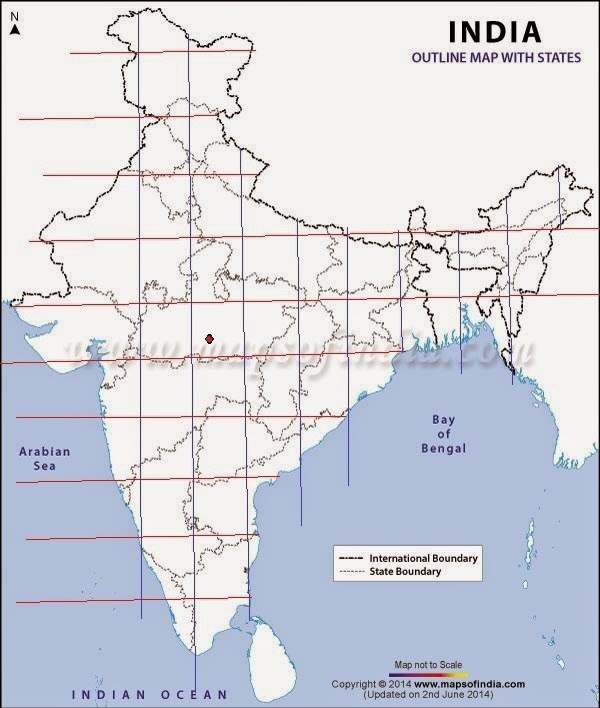 regarding your grid pattern ,i found it is not symmetrical….means grid are not of same size..how u plot them on map. Sir,on what basis you have provided those 30-35 map points in one map? Great job! Hats off!! thanks a lot!! !